Thanksgiving week can feel rushed – its a short work week ahead of what, for some, will be a four day weekend, there’s housecleaning, shopping and prep for Thanksgiving dinner and family and friends arriving. The pre-holiday excitement and stress starts this week and this year Thanksgiving comes on the heels of a contentious election which for many has been stressful, adding apprehension or anticipation for what is to come. This is a good time to pause, take a deep breath, and be thankful for the amazing place we live. We are lucky to be in the Pacific Northwest, one of the most livable places in the country and a region that enjoys a robust economic and and employment environment, benefits from nationally recognized public schools, has a wealth of heritage and diversity and is surrounded by breathtaking lakes and mountains. Its a great place to call home. The shopping frenzy and the traffic starts Friday but its also the start of Snowflake Lane, Bellevue Magic Season and the Botanical Garden’s Garden d’Lights, Eastside traditions that turn Bellevue into a holiday wonderland. This weekend is Small Business Saturday; don’t forget to visit Main Street and other area businesses and restaurants to support local merchants. Forget shopping, traffic and turkey hangovers . . . GO HAWKS, HUSKIES & SOUNDERS. The Sounders play at home tonight in the Western Conference Finals, the Huskies travel to Pullman for the Apple Cup on Friday and the Seahawks are in Tampa Bay Sunday to play the Buccaneers. The sun is out, temperatures are well above freezing, we’re half way through the football season (GO HAWKS!) and the holidays are just around the corner. Also just around the corner is the potential for wind, heavy rain and even snow that could leave many without power, access to transportation, stores and services. You can’t predict this winter’s weather, but you can take steps to be prepared in the event you find yourself in a dark house with no power for hours or days. Now is the time to put together a “go bag” or basic survival kit that has more than flashlights (no doubt with dead batteries) and bottled water. Plan to assemble an emergency kit with enough supplies to help you get through 3 days. FIRST AID KIT – the basics should include bandages, gauze, antiseptic wipes, anti-inflammatory and pain reliever medications (Tylenol or Advil), antacid, antibiotic ointment. Prescription medications should be clearly labeled. FLASHLIGHTS – multiple flashlights or camping lanterns and extra fresh batteries. CANDLES – don’t forget lighters or matches. BATTERY POWERED RADIO – having access to area information (and entertainment) is important – some battery powered radios have outlets for charging cell phones. BOTTLED WATER – stock plenty of water for family members and pets. Sports drinks are good to have for replenishing electrolytes. FOOD – stock nonperishable, easy to prepare snacks and meals (dried fruit, peanut butter, granola bars, canned vegetables, nuts, canned tuna, soup, etc.). DON’T FORGET TO INCLUDE A CAN OPENER. If you have a gas cooktop in your home, the burners can be lit with a lighter or match to facilitate cooking. PET SUPPLIES – pack food and water, extra leashes, any medications your pet may need, contact information for your vet. CASH – if there’s a widespread power outage ATMs and credit card machines won’t operate. Stores may be able to operate on a limited basis with generators but will be cash only. Keep cash on hand to purchase food, buy gas for the car. IMPORTANT DOCUMENTS – have hard copies or digital access to medical records, driver’s license, social security numbers, etc. HYGIENE PRODUCTS – toothbrush, toothpaste, soap, feminine products, body-cleansing wipes, hand sanitizer, toilet paper & tissue. ADDITIONAL ITEMS – space limitations may impact what you can keep on hand. It helps to know where extra blankets or sleeping bags are stored. If you have children it helps to keep them entertained or distracted from the situation with coloring books, cards, puzzles, etc. If you live in the city you may be able to walk to services and amenities during a power outage but remember, elevators won’t be working, so you may find yourself confined to the upper floor of a building or face walking dozens of flights of stairs to exit your building. Its definitely worth it to plan and prepare for the worst and hope that bad weather and power outages skip us this winter. Due to the construction at the Downtown Park this winter, the Bellevue Magic Season ice skating facility will be temporarily located at Ashwood Park next to the Bellevue Library for the 2016-2017 season. Crews started setting up last week in preparation for the arena’s opening in less than three weeks. The ice arena – the region’s largest open-air holiday ice skating area – will allow for skating rain or shine and offer food and beverage concessions. The arena will be open November 25th through January 8th – don’t miss special events which include free skate Mondays, free skating lessons, stroller skate Thursdays and family skate events. Parking will be available at the Bellevue Library parking garage, the new 929 Office Tower (on 108th Avenue between NE 10th and NE 8th Streets) and at the Griffin Parking Lot (at the corner of NE 8th Street and 110th Avenue NE). It will be a nice change to have one of the popular Bellevue Magic Season venues located on the north end of downtown for this holiday season. We are fortunate to live in an area where there are so many local parks. 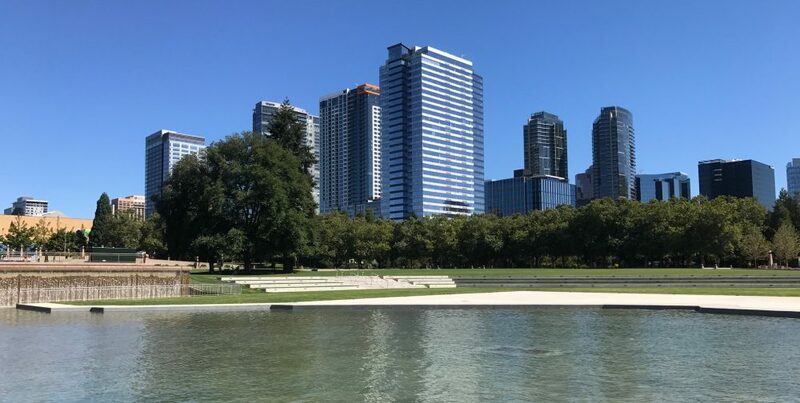 The cities of Bellevue and Kirkland have both done an amazing job of retaining land and creating waterfront and urban parks for residents and visitors to enjoy. I live on the north end of downtown Bellevue, so McCormick Park is one of my favorites (and my dogs). Every fall I look forward to the amazing display of color that comes from this little maple tree in McCormick Park. .